WILLIAM A. WETTER, farmer, section 36, Root Township, owns forty acres of land in that township. He was born in Switzerland, September 12, 1836, and was nineteen years of age when he came to America. He settled in Seneca County, Ohio, living there one year, took a tour through the Northwestern States, was absent two years, then returned to Switzerland. After six months' sojourn in his native country he came back to America, accompanied by his father and two sisters, the mother being deceased, and purchased eighty acres of land in Union Township. The farm is now owned by John Speeler and Andra Niblick. The father returned to Switzerland in 1860, and died there in 1869, aged about seventy-two years. The parents of our subject were Andrew and Mary (Myers) Wetter. The mother was born in Switzerland in 1795, and died in1851. The two sisters who came to America were Elizabeth and Fanny. Elizabeth was married in 1859 to Jacob K. Myer, and she died in California, whither they had removed soon after marriage. Fanny was married in 1859 to George Speeler; her husband died in hospital at Jeffersonville, Indiana, during the war. For a second husband she married Joseph Speeler, who is also deceased. William A. was first married to Anna E. Struby, October 6, 186, who was born in Switzerland in 1837, and came to America in 1855. She was married in Tifflin, Ohio, and died in Union Township January 9, 1879, leaving one child, Mary E., born March 20, 1871. Immediately after the death of his wife, Mr. Wetter went to California, taking his child with him. He remained there three years engaged in farming, and in 1882 returned to Adams County, leaving his daughter with Jacob K. Myers, who is a farmer there. September 12, 1882, he was married to Mrs. Anna Heiptley, widow of Rudolph Heiptley, who was born in Biberstein, Switzerland, December 31, 1838, and came to America when twenty years of age, settling in Attica, Ohio, where he learned the trade of blacksmith. He was married January 30, 1866, and died September 23, 1877, in New Washington, Crawford County, Ohio, of consumption. He left one daughter, now the wife of Wesley Stults. Mrs. Wetter was born March 23, 1845, in Philadelphia, and when four years of age removed with her parents to Seneca County, Ohio, where she was reared and twice married. Her parents were Henry and Anna (Myers) Werder. Both parents were born in Switzerland, the father in 1812, and died in 1870. The mother came to America when nine years old, and died February 28, 1873. Mr. and Mrs. Wetter have one child, Letta, born October 2, 1883. Both families are of German origin. JOHN P. GASS, an old settler of Washington Township, was born in France November 24, 1813, a son of Catherine and Henry Gass. In 1828, with his parents he immigrated to America, coming over in a sailing vessel and being thirty-eight days on the ocean. They landed in New York City and first located in Oswego County, New York, where they lived about nine years, then removed to Wayne County, Ohio, residing there about nine years. Our subject was married in Wayne County in April, 1846 to Miss Catherine Moine, and they had three children, only one living - Mary C., wife of Michael Miller. In the fall of 1847 he came to this county and settled in the woods on section 33, Washington Township. He first built a log cabin, then began clearing his land. His first crop was five bushels of wheat. They next year he raised three acres of wheat and three acres of buckwheat. This year's crop gave him a good start, as he had about forty bushels of wheat and thirty bushels of buckwheat. In later years he was quite prosperous and built his present residence, which gave his family a comfortable home. Mrs. Gass died January 12, 1883. He is a Democrat in politics, and is a member of the Catholic church. He has served as road supervisor, and also as administrator of estates. When he came to the county he had a team, wagon and $20 in money. All he has he has earned by hard work and good management. His daughter, Mrs. Miller, resides on the old homestead. Mr. and Mrs. Miller have one child - Bertha E. Both Mr. Gass and Mr. Miller are Democrats. DANIEL HINES, farmer, section 17, Union Township, came to this county in the fall of 1839, and entered 160 acres of land on the southeast quarter of section 9, Union Township, which was then attached to Root Township. He was the first white settler in the township and made the second entry of land, the first having been made by James McCrumb, an Irishman, who never settled on his land. It was afterward sold to William May. Mr. Hines cut his own road from Monmouth to his land. He came with a two-horse team and covered wagon, accompanied by his wife and three children. The family camped at Sampson's while the father was building the round-log shanty. Mr. Hines hired William P. Rice to assist in building the shanty, and he was employed two months in building house, stable, and splitting rails and digging a well. He lived in that house until 1870, when he traded it for his present property, consisting of eighty acres of land, and received $2,000 besides. Mr. Hines was born in Loudoun County, Virginia, January 9, 1804, where he was reared and educated. He was married in Fredericktown, Maryland, in 1826, to Sarah McCimmey, who was also born in Loudoun County. Mr. and Mrs. Hines lived in that county until four children were born, then removed to Harrison County, Ohio, near Cadiz, where Mr. Hines bought eighty acres of improved land. He lived there about one year, then sold and removed to Carroll County, where he purchased eighty acres of improved land within five miles of Centerville, the county seat, and lived there five years, when he sold and came to Adams County, where he has since resided. He came with a good two-horse team and wagon, plenty of bed clothes, and $700 in money. The family experienced all the toils, cares, and privations incident to pioneer life. Mr. Hines' father, John Hines, was born in Georgetown, Virginia, and died in Loudoun County, same State, past sixty years of age. He was a solider in the war of 1812. The mother, Hester (Wine) Hines, was born in Loudoun County, and died in Perry County, Ohio. His grandfather, Phillip Hines, was born and died in Georgetown, Virginia. Mrs. Hines died February 8, 1878, and a granddaughter, Elizabeth Miller, kept house for him until his second marriage, which occurred August 8, 1880, to Sarah J. Rauer. She was born in Union Township, this county, April 1, 1854. They have one child, Catherine, who was born December 28, 1880. By his first marriage Mr. Hines had ten children - Rosanna, Mary C., Ann C., Sarah W., Elizabeth, Virginia, Lucinda L., Margaret F., Jane, who died at the age of two years, in Carroll County, Ohio, and Hester A., who died in 1882, after her marriage, leaving four children. Mrs. Hines is a daughter of John G. and Catherine (Welty) Raner; the mother was born in Tuscarawas County, Ohio, in 1828, and both are living in Union Township. The father was born near Canton, Ohio, in 1828. He served three years in the late war and now draws a pension. JOSEPH ANDERSON, an active and enterprising farmer of Wabash Township, residig on section 21, was born in Washington County, Pennsylvania, April 25, 1826, a son of James and Sarah (Allision) Anderson, natives of Pennsylvania, the father of German and the mother of Irish origin. The parents of our subject removed with their family to Fairfield County, Ohio, and afterward went to Licking County, where the mother died. The father died in Franklin County, Ohio. They were the parents of thirteen children. The father being a farmer, Joseph, our subject, was reared to the same avocation. As soon as he as old enough he began working out on farms by the month, and after a time engaged in farming on his own account. He was married in Adams County, Indiana, December 25, 1857, to Miss Jane Linton, a native of Darke County, Ohio, born March 13, 1834, a daughter of Samuel Linton, an old settler of Adams County. Six children have been born to Mr. and Mrs. Anderson - Samuel H., James P. (deceased), Joseph H., William S. (deceased), John A. and Margaret E. Mr. Anderson has been a resident of Adams County since 1856, and September 1, 1884, settled on his present farm. Both Mr. and Mrs. Anderson are members of the Methodist Episcoal church and among the respected citizens of Adams County. JEFF LEHMAN, secretary and treasurer of the Hoosier Roller Milling Company of Berne, Adams County, Indiana, was born in Monroe Township, Adams County, the date of his birth being June 8, 1860. His parents Peter S. and Verena (Sprunger) Lehman, were natives of Switzerland, where they were reared and married, and to them were born one son and seven daughters. They came to America in the spring of 1852 and settled on section 32, Monroe Township, Adams County, where the father purchased land and engaged in farming. He remained on this land until April 1, 1868, when he sold out and removed to Hickory County, Missouri, where he bought a farm on which he has since resided. He is a member of the Mennonite church, and has been in the ministry about forty years, which calling he still follows. Jeff Lehman, whose name heads this sketch, was eight years old when his parents removed to Missouri, and there he grew to manhood on the home farm, receiving his education in the common schools of his neighborhood. In 1880 he came to Berne, Adams County, indiana and for one year found employment in the grain elevator of J. J. Hirschy & Co. He then engaged in the general mercantile business in partnership with J. A. Sprunger, with whom he was associated until the spring of 1886, when he disposed of his interest to his partner. Mr. Lehman now represents the Continental Insurance Company of New York, and also the Red Star Line steamship line to Europe, besides holding the position of secretary and treasurer of the Hoosier Roller Milling Company. February 7, 1883, he was married to Elizabeth Neuenschwander, who was born in Monroe Township, Adams County, August 20, 1864, a daughter of Christian P. Neuenschwander. They are the parents of two children - Rosa Mina, born April 3, 1884, and Gustav Adolph, born July 20, 1886. Both Mr. and Mrs. Lehman are members of the Mennonite church. In politics Mr. Lehman is a Republican, and has filled several local offices. He is one of the self-made men of the county. On coming to Berne he was $10 in debt, but by persevering industry and good management he has become one of the well-to-do citizena of his town. He owns one of the many fine residences of Berne, which he erected in the summer of 1885, at a cost of $1,600, the lot and house together costing $2,000. JOHN CRAWFORD, of the mercantile firm of Niblick, Crawford & Sons, was born in Waynesburg, the county seat of Greene County, Pennsylvania, September 14, 1816, where he was reared in no particular calling. He was given an ordinary common-school education. During his boyhood he clerked for a time in his father's store, and at the age of twenty years was employed as clerk in the collection office of the Pennsylvania Canal Company at Allegheny City, and was so employed for one year; then during the year 1840 he was engaged clerking on the steamer Marion on the Ohio and Wabash rivers. In the fall of 1852 he came to Adams County, Indiana, and located on land that he had entered when on a previous visit in 1838, and engaged in raising and dealing in stock. In 185 8, having discontinued the stock business, he engaged in the mercantile buines with John D. Nutman, under the firm name of Nutman & Crawford, the firm continuing until 1866, when Mr. Jesse Niblick became the successor of Mr. Nutman, and the firm was named Niblick & Crawford. The firma has since been changed to Niblick, Crawford & Sons, a son of each becoming members of the firm. Politically he is Democratic. After holding numerous township offices, he in 1851 was elected a Representative in the Indiana Legislature. This was during the session known as the long term, being the first term after the new State constitution was adopted. In 1852 he was elected treasurer of Adams County, and was re-elected in 1854 and served the full four years. Since then, with the exception of holding the position of school trustee for the village and city of Decatur for some twenty-five years, he has devoted his time to his mercantile business. September 14, 1843, he was married in Wabash Township to Miss Mary A. Abnett, daughter of Jacob Abnett, one of the pioneers of Adams County. Her mother's parents were originally from Virginia, where she was born, but reared in Ohio. She died in Decatur. They had eight children, four of whom are living - Caroline, wife of Miller Burns, in the harness business at Decatur; Mary A. Congleton; Frank, a member of the firm of Niblick, Crawford & Sons, and William H., living in Decatur. GIDEON BROTHERS - Frank, John and Henry Gideon, farmers and millers, were born in Franklin County, Ohio, and came to this county in 1857 with their parents and other children, who settled on the farm where Frank now lives. The father, Henry Gideon, was born in Erie County, Pennsylvania, where he lived until twenty-four years of age, when he went to Lehigh County, Pennsylvania, where he was married to Mrs. Lydia Turner (maiden name Bevelhimer). They removed to Franklin County, Ohio, from there to Van Wert County, and from Van Wert to Adams County, Indiana, where they lived until their death. The father died December 17, 1868. Their mother was born in Lehigh County, Pennsylvania, in 1813, and died in Adams County, Indiana, October 12, 1880. They are buried in Bethel cemetery. Their mother had two sons by her first marriage - Conrad and William D. Turner. They grew to manhood and started to California. Conrad died on the way, and William was gone nine years, came home, married, and is now living in Mount Cory, Ohio. By her second marriage there were eight children. The oldest daughter, Mary, married John Knittle, of Van Wert County, and is now living in Adams County, Indiana. She has three children. The second daughter, Susan, married Charles C. Slack, and removed to Kansas, where they are still living. She has one son. One daughter, Louisa, died at the age of two years. The fourth, Martha E., married R. C. Baxter, and is living at Wolfcale, Ohio. The fifth and youngest daughter, Emma Rosetta, married Z. T. Coleman, and is living in Mount Cory, Ohio. They have two children. Henry C. Gideon married Miss Hannah Stevens, and is living in Paulding County. John M. Gideon married Miss Eva Steele, who died May 21, 1886, leaving three children. John and his children are now living in Decatur, Indiana. Frank, the youngest son, married Miss Kate Muma, and is living on the old home place. They have two boys - Roland V., born August 1, 1878, and Glenn G., born August 12, 1880. Henry, John and Frank Gideon have followed saw-milling since they went in business for themselves in 1872. THOMAS C. BIXLER, is a native of Adams County, Indiana, born in Root Township, May 11, 1854, a son of Henry and Penelope (Johnson) Bixler, natives of Pennsylvania, the father born in 1829, and the mother in 1836. His mother died when he was thirteen years old, and from that time he has depended on his own exertions for his support. His school days ended when he commenced life for himself, but being naturally observing and having a retentive memory he has acquired a practical business education, which places him in the front rank of the young men of his county. Mr. Bixler was married June 16, 1881, to Miss Anna C. De Lerey, a native of Seneca County, Ohio, born July 12, 1860, daughter of Francis and Sophia (Omlor) De Lerey, natives of Hesse Darmstadt, Germany, the father born June 26, 1826, and the mother in 1836. Her paternal grandparents, Adams F. and Barbara (Hape) De Lerey, were natives of Germany, where they passed their lives, the latter dying when her son was but six weeks old. The father was a soldier in the German army, serving from his twenty-first to his twenty-seventh year. Mr. and Mrs. Bixler have three children - Lewis E., born November 16, 1882; Mary H., born May 14, 1884, and John H., born June 17, 1886. CHRISTIAN BURGHALTER, one of the prosperous agriculturists of Wabash Township, residing on section 19, is a native of Switzerland, born February 5, 1833, a son of Christian and Emily (Wurst) Burghalter. His parents immigrated with their family to America in 1852, first settling in Wayne County, Ohio. They subsequently came to Adams County, Indiana and resided on the farm of our subject till their death, the father dying in May, 1872, and the mother in April, 1875. Both were worthy members of the German Reformed church. They were the parents of four children, two of whom are living. Christian Burghalter, whose name heads this sketch, was reared and educated in his native country, coming to America when about nineteen years of age. He served an apprenticeship of two and a half years at the carpenter's trade, which he followed till he came to Adams County, in October, 1859. He was united in marriage July 5, 1858, to Miss Mary Hartman, a native of Wayne County, Ohio, born November 30, 1835, and to them have been born eight children - Emma, born May 29, 1859; Emily L., December 19, 1860; Mary A., March 31, 1862; Elias, born July 20, 1865, died February 4, 1869; Daniel, born October 16, 1867; Sarah A. April 5, 1870; Lydia, September 14, 1873, died in February, 1874, and Ida M., born July 27, 1875. On coming to Adams County, Mr. Burghalter settled on eighty acres of his present farm, which he had previously purchased living in the log cabin, 18 x 20 feet in size, which was on his land until his present fine brick residence was completed in the summer of 1883. Mr. Burghalter sawed the lumber and burned the brick for his house, which was built at a cost of about $2,500. His out-buildings are large and commodious, and all have been painted, presenting an attractive appearance. He has one barn 36 x 60 feet in size, and another, built in 1881, 45 x 100 feet. He commenced life for himself with but little means, and his success in life is due to his own exertions, his fine farm, which now consists of 404 acres, having been acquired by years of hard work and persevering energy. In connection with his general farming he devotes considerable attention to stock-raising, and was one of the first in his neighborhood to engage in the raising of blooded stock, commencing with short-horn cattle. He is now making a specialty of Holstein cattle. 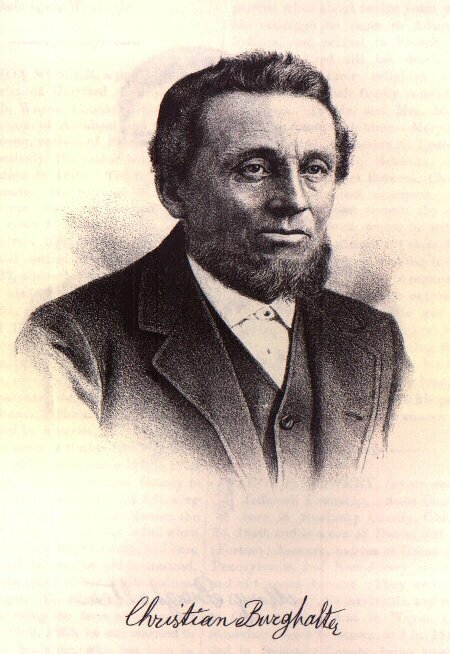 Mr. Burghalter takes an active interest in educational affairs, and is now educating his son, Daniel, who is at present attending a mission house at Sheboygan, Wisconsin. Click here for photo of Christian and here for photo of his wife. SOLOMON MOSSER, a prominent agriculturist of Hartford Township, was born in Wayne County, Ohio, March 20, 1843, a son of Abraham and Catherine (Eicher) Mosser, natives of France and Germany respectively, the father born in 1793, and the mother in 1800. The father was a weaver by trade. He traveled in different parts of Europe, and was married in Germany. He came to America with his wife and two children, one child having died in Germany, and settled in Wayne County, Ohio, in 1827, where he engaged in farming. He removed his family to Adams County, Indiana, in 1854, and made his home on section 22, Hartford Township, till his death, which occurred March 25, 1876. The mother died in November, 1870. Fourteen children were born to them, seven sons and seven daughters. The parents were members of the Mennonite church. The father had but $100 when he landed in America, and with this he bought eighty acres of timber land, which he improved and added to it, and sold it in 1853. He then bought land in Adams County to which he removed his family the following year, as before stated. Solomon Mosser, the subject of this sketch, was but a lad when his parents came to Adams County, and here he grew to manhood on the old homestead, and in his youth received but limited educational advantages. On attaining his majority he began working the farm on shares for one year. March 9, 1865, he was married to Miss Elizabeth Schlatter, who was born in French Township, Adams County, October 28, 1846, a daughter of Joseph Schlatter, an old settler of French Township. He was born in Germany, coming to America with his parents when about twelve years old. After his marriage he came to Adams County, Indiana, and he settled in French Township, where he lived till his death. He and his wife in their religious faith were Mennonites. Their family consisted of five daughters. To Mr. and Mrs. Mosser have been born fourteen children - Mary, David (deceased), Joseph, Catherine A., Lydia, Franna, Abraham (deceased), Solomon, John H., Elizabeth E., Barbara Rebecca, Christian C., Noah, and an infant unnamed. After his marriage Mr. Mosser bought the old homestead of his father on which he still resides, and cared for his parents till their death. He has improved his farm, making it one of the finest in the township, and in connection with his general farming he is extensively engaged in raising stock. He was the first man in his township to engage in raising thoroughbred stock, commencing this enterprise in 1877, and has now on his farm several head, some of which were brought from Kentucky. Mr. Mosser, like his parents, is a member of the Mennonite church. JACOB B. MOWERY, farmer, section 19, Jefferson Township, Adams County, was born in Sandusky County, Ohio, April 23, 1840, and is a son of Daniel and Phoebe (Fortney) Mowery, natives of Union County, Pennsylvania, and New Jersey, respectively, and of German descent. They were married in Union County, Pennsylvania, and removed to Ohio, settling first in Wayne County, removing thence to Seneca, and in 1833 settled in Sandusky County, being among the early settlers of that county. There the father entered land from the Government, on which they lived till their death, the father dying in 1870, aged seventy-three yeas, and the mother dying at the age of seventy-three years in 1874. Both were members of the Lutheran church. They were the parents of thirteen children, nine sons and four daughters. At the first election held in his township, after settling in Sandusky County, only three votes were cast, he casting the only Democratic vote. Jacob B. Mowery, the subject of this sketch, grew to manhood in Sandusky County, Ohio, receiving but limited educational advantages, his youth being spent in assisting his father with the work of the farm, remaining at home until twenty-five years of age. He was married August 27, 1863, to Miss Jane Smith, who was born in Sandusky County, Ohio, January 19, 1846, a daughter of Eli and Matilda (Hisenhour) Smith, the father being a native of Columbiana County, Ohio, and the mother of Sandusky County. The parents of Mrs. Mowery settled in Tippecanoe County, Indiana, where the mother died, and after her death the family returned to Sandusky County, and later removed to Michigan, where the father still resides. He had a family of seven children, five sons and two daughters. Mr. and Mrs. Mowery are the parents of six children - Matilda C., Daniel E., Edward E., Some R., Samuel C. and Della B. M. Mr. Mowery was a soldier in the war of the Rebellion, enlisting February 5, 1864, in Company G, Third Ohio Cavalry. He was attached to the Twenty-third Army Corps under General Thomas, and later to the First Cavalry Corps under General Wilson. He participated in the battles of Resaca, Kenesaw Mountain, Peach Tree Creek, and in the battle of Atlanta, besides other battles and skirmishes. He served until August 16, 1865, when he was discharged at Edgefield, Tennessee, by reason of the close of the war. He contracted deafness while in the army and now draws a pension. After his discharged Mr. Mowery returned to his home in Sandusky County, and engaged in farming and teaming. October 20, 1881, he came to Adams County, Indiana, and settled in Jefferson Township, on the farm where he now resides, where he has eighty-two acres, seventeen under cultivation. In politics Mr. Mowery was formerly a Democrat, but now affiliates with the Republican party. He is a member of John P. Porter Pst, No. 83, G. A. R. Both he and his wife a members of the German Baptist church. The parents of Mrs. Mowery were Lutherans in their religious faith. WILLIAM BERGER, farmer, residing on section 9, Kirkland Township, is a son of Nicholas and Susamma (Smith) Berger, who were early settlers of Adams and Wells counties, Indiana. He was born at Bethlehen, Stark County, Ohio, April 18, 1851, where he passed his early life on the home farm, and when old enough began working out on neighboring farms. He was united in marriage September 18, 1879, to Miss Emelina billman, who was born on her father's homestead in Kirkland Township, Adams County, May 17, 1857, and to them have been born two children - Catherine A., born September 23, 1881, and Elizabeth M., born December 7, 1885. They settled on their farm in Kirkland Township in January, 1884, which contains 120 acres of good land, and here he has since been engaged in general farming. He erected his present comfortable and commodious residence in the summer of 1886, at a cost of about $1,000. In his political views Mr. Berger is independent, voting for the man whom he deems best fitted for office. He is a prominent man in his township, and has filled several local offices. Henry Billman, father of Mrs. Berger, was one of the pioneers of Adams County, settling in Kirkland Township as early as 1855. He was born December 19, 1829, in Schuylkill County, Pennsylvania, and there he was reared to manhood, and was married November 13, 1853, to Mary Zimmerman, who was also a native of Pennsylvania, born in Berks County April 28, 1831. Seven children were born to this union, two sons and five daughters. Mr. Billman came to Adams County, Indiana, immediately after his marriage, and settled on his farm on section 13, Kirkland Township, where he lived till his death. His farm at that time was heavily covered with timber, with no roads leading to it. He first built a log cabin and commenced improving his land, and here he and his family experienced may hardships and privations incident to life in a newly-settled country. They lived in their pioneer log cabin several years, when they built a hewed-log house, in which they spent the rest of their days. He died February 26, 1880, much respected by a large circle of friends and acquaintances. His wife died November 9 of the same year. Both were members of the Dunkard church.